Tech ARP - ED#187 : How Well Does The Samsung S Voice Work? ED#187 : How Well Does The Samsung S Voice Work? The Samsung S Voice is Samsung's answer to Apple's Siri - an intelligent personal assistant with a natural language user interface. In other words, you speak to it like you would any other person and it will interpret your commands and carry them out. The Samsung S Voice doesn't process the voice commands on the device itself, but transfers them to a web service that interprets the commands before sending them back to the device. This web service used to be based on Vlingo but now runs on Nuance. As a result, the Samsung S Voice is completely reliant on Internet connectivity - it cannot work without Internet access. Today, we are going to perform a few simple tests to see how well the Samsung S Voice works on the Samsung Galaxy Gear S smartwatch. 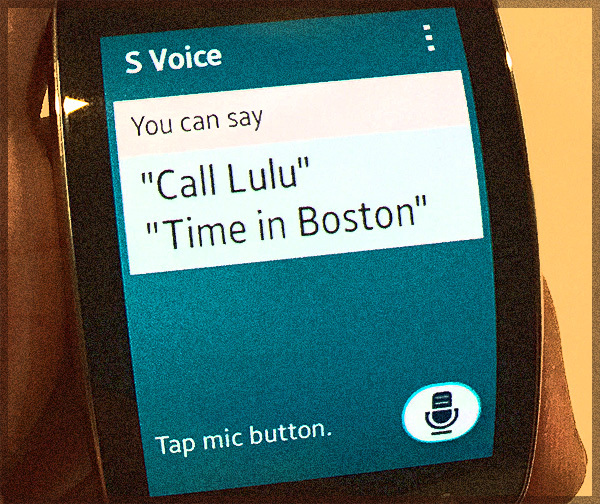 The S Voice is an important feature on the Gear S smartwatch because it can help to get a lot of things done without pecking away at the Gear S' tiny keyboard. At least, that's the idea! In this example, I will issue a simple command to display the current weather report. Note that this test was done with the Samsung Galaxy Gear S connected to the Internet via WiFi. It took the S Voice service about 23 seconds to interpret my simple "Check Weather" voice command. Then it took the Gear S smartwatch another 10 seconds to retrieve the week's weather report. Note that the second try resulted in a faster initiation of the instruction, so it's possible that the S Voice service didn't time out, but rather failed to interpret my accent. The change in my intonation during the second try appear to help it recognize the command faster. In this example, I used S Voice to call a telephone number. If you sync the Gear S with a Samsung Galaxy smartphone, you can ask S Voice to just call the person, but since I chose to run the Gear S independent of any smartphone, I had to call the number directly. The good news is - Samsung S Voice recognized the voice command and the 10 digits correctly. The bad news is - it took 11 seconds to do so. Perhaps a change of intonation might help speed things along. An American or Korean accent might not be a bad idea, I reckon! These malware could be using your smartphone to mine cryptocurrencies! In this example, I tried to send an SMS to a fictional number. This is very important as typing out a message on the Gear S is tedious. Using S Voice is much more convenient. In fact, I prefer to use it than type. Should you select MBR or GPT when you install a new drive? If you have a scoop you want to share with us, just contact us! It doesn't have to be cryptographic-related. It can be anything in the tech industry, from mobile phones to P2P software. Just drop us a message! Save Your Mobile Phone From Theft!